The convergence of IT and OT has dramatically altered the investing landscape. The convergence of IT and OT dramatically alters investing activities in corporate development. We wake up routinely to the news of one acquisition or another. Most stories repeat the refrain, “Big fish bought little fish”. We hit snooze and move on. However, lately the world of technology acquisitions have become more interesting due to IoT. 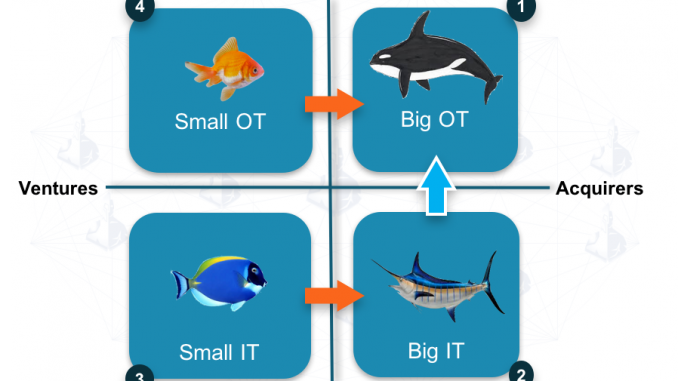 Applying IT to OT (“operational technology”, loosely referring to industrial products and services sectors) in industries to modernize their offerings and operations has brought forth a new breed of big fish to the buyers’ table. In Part I of this series, we focused on product strategy and how products need to be modernized for the digital age. In Part II, we looked at go-to-market strategy, how IoT products are sold and bought. 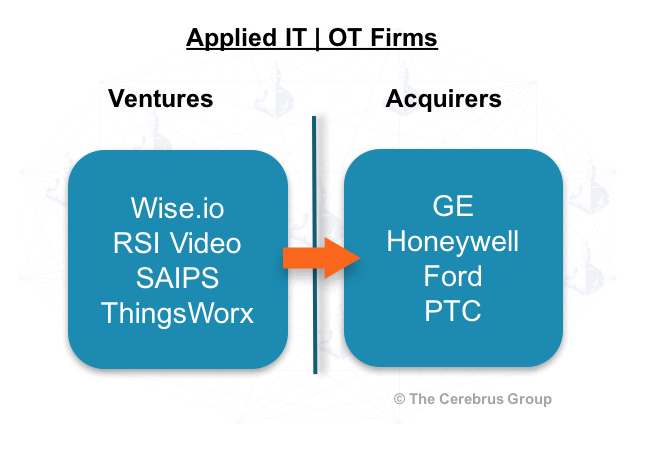 In Part III of this series on IoT = IT + OT, we will look at how players from the world of IT and the world of OT are fishing in the sea of acquisitions, ventures, and alliances and how that changes the corporate development outlook in companies. This new dynamic has implications for you as a corporate development leader in IT or OT firms, as an entrepreneur, or even as an investment banker. First, let us look at the historical simple world of IT ventures and acquisitions. We see acquisitions like the ones below often — a small software or hardware firm getting snapped up by an established IT player. 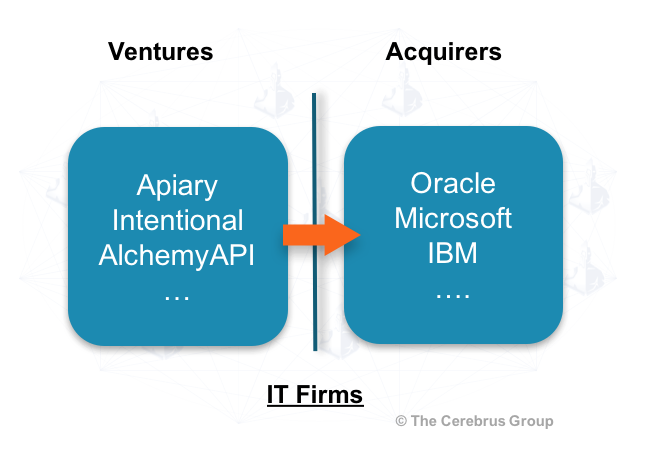 Examples above are API companies or other software companies acquired by Oracle, IBM, and Microsoft. Countless examples of this play out across all parts of the IT stack, from network-server-storage areas to middleware to apps, analytics, AI, and security. We all expect this: startups building horizontal (industry-agnostic) technology being acquired by large IT players. Against the above historical backdrop, we’ve been seeing a new type of acquisition by large, vertical-specific OT players acquiring ventures focused on vertical industries. A very small sampling of them below. 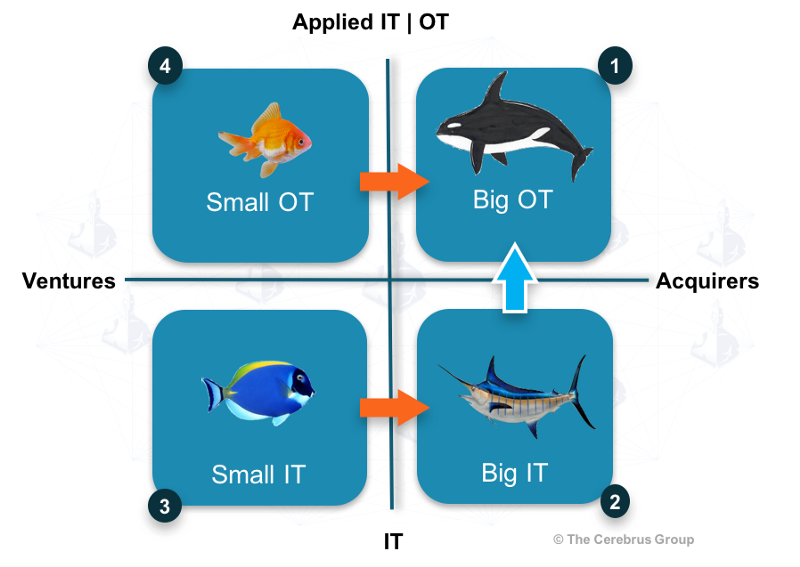 Unlike the IT startups, the shoal of fish on the left is focused on applying IT to specific vertical industry or operational domain problems. e.g. wise.io for service tickets, SAIPS on AI for vision, ThingWorx for industrial IoT etc. Five years ago these ventures would have been acquired very predictably by traditional IT players. Now there is competition for investments and acquisitions from the OT players. The graphic below shows both the historic IT and new OT dynamic together. Investors and acquirers from quadrants 1, in addition to 2 are scouring the venture landscape, establishing outposts in Silicon Valley and other startup hubs, influencing startup direction and deal flow early, and sometimes competing with VC firms for influence. Below is a generalization of the investment and acquisition patterns and players by quadrant. Big IT: Traditional tech players. Note: Excludes Google, Amazon etc. who don’t fit in a particular quadrant above, but span quadrants 1 and 2. Just as the supply of small technology firms have increased due to cloud, the potential investors for startups have increased as well. 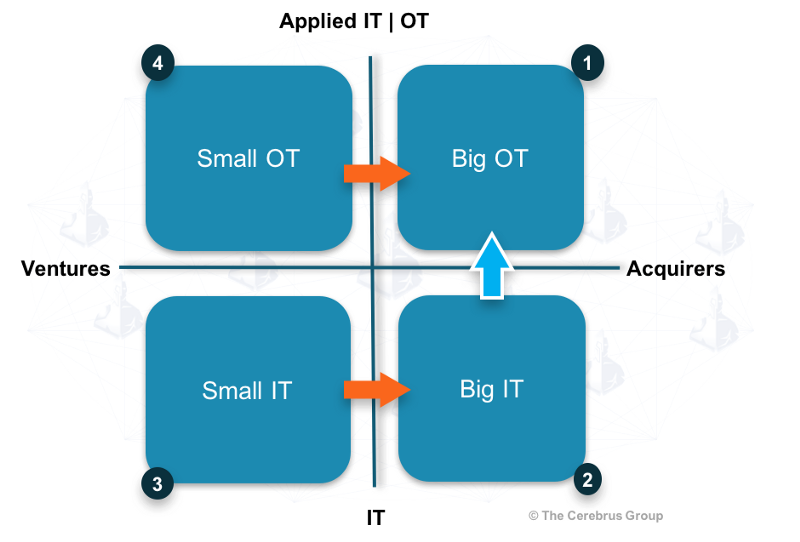 Mature buyers from the OT world are investing in and acquiring from small OT and small IT quadrants. Innovators dilemma problems galore in the big IT quadrant 2. Collectively, they aren’t providing or are unable to provide verticalized solutions while busy trying to stave off cloud competitors. That’s a battle on two fronts simultaneously for big IT! Note: Apple’s acquisition of Lattice Data is another wrinkle in this whole landscape, given the way a corporate acquisition bypassed traditional VC route altogether. Lattice could have exited to quadrant 1 or 2. Should you acquire for tech, talent, or new business? : This continues to be a perennial question that reverberates in the hallways. While the question itself has not changed, the actions from the answer is changing. Target Scouting and Classification: e.g. Is the target an artificial intelligence software provider or an AI software provider for health? Internal Alignment: How do you align the new target’s investments with internal business unit’s goals? Is the new technology enabling multiple internal businesses? How should it be structured and measured internally if acquired? Strategic Alliances: As a big IT player, how do I build alliances with OT players, especially those that acquire or create new IT components? Caution: Frenemies abound! Product and GTM Focus: As an entrepreneur, do I build a horizontal technology product or vertical industry solution? Is my GTM through an IT behemoth? Which channel partners do I need? There you have it. The simplified view of the foraging and predatory habits of the various fish and its implications on corporate development. It is an exciting marine world out there!